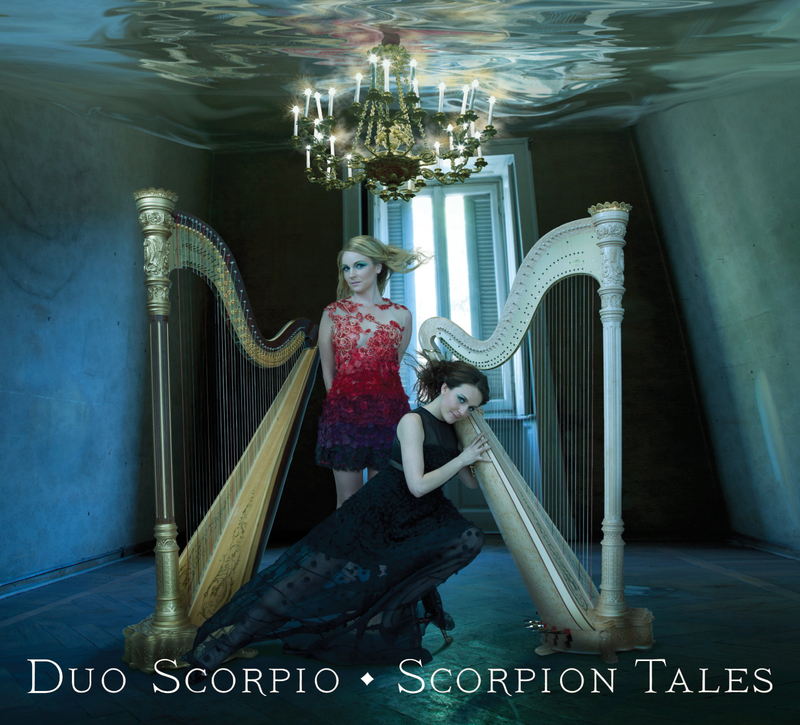 Duo Scorpio: Relevant, Hip…and Harps! The image of the harp, or the Modern Pedal Harp, as we know it today, may bring to mind thoughts of angels in the clouds and the movement of celestial bodies across the sky. As syrupy sweet as these images are, they were blown to bits and pieces last Tuesday night (Oct. 17, 2012) when Kathryn Andrews and Kristi Shade of Duo Scorpio proved that the harp is much more than just pretty. They convinced both the audience and me that the harp could be ethereal, but also rhythmic, percussive, intense and defiant. 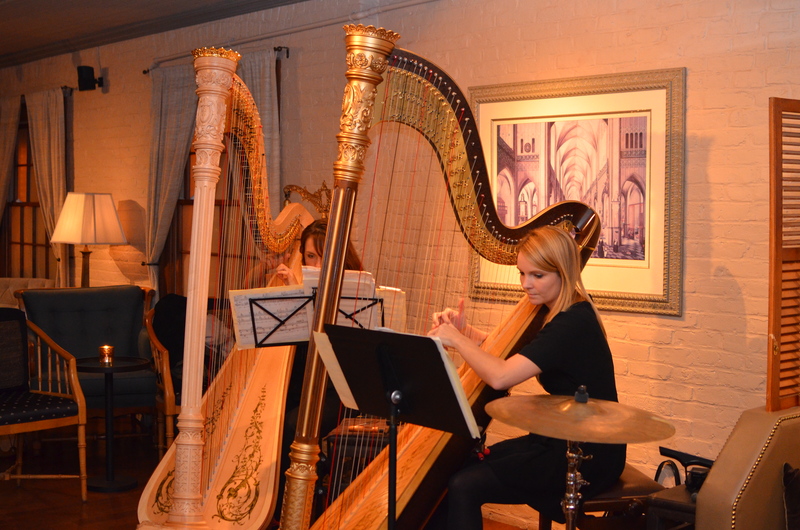 When I was asked to review a harp duo concert on a Tuesday night, I wasn’t exactly sure what to expect. But, I’ve always been fascinated by the instrument and so went to the address listed on my ticket, while keeping an open mind. I found the building and was directed to a little secret back door—from then on I was totally transported. The venue was a wonderfully intimate bar/lounge that made me think of what speakeasy’s must have been like in the roaring 20’s. This was the 2nd Floor on Clinton Lounge run by gentleman Tony Powe. There were low plush banquettes divided by louvered screens that were perfect for secret conversations or romantic meetings. I was calmed by the casual and comforting clink of ice cubes in glasses at the small but polished antique bar and I found myself waxing poetically somewhere between Boardwalk Empire and Downton Abbey. Candles flickered on low tables and there were chairs and sofas centered around the “stage” space. The small venue could only hold about 25-30 people, but this was its best feature. Intimate as it was, it provided a close up and personal encounter with the two enormous harps that dominated the performance space and the performers who would play them. From the moment I walked in, I could only think of one word, one theme for the entire evening. That word is intrigue. Every aspect of the experience was full intrigue. The crowd slowly trickled through doors in a casual way. Drinks were served, the lights were dim and everyone relaxed. The concert began. Katie and Kristi wasted no time and jumped right in. Within seconds, the looming harps were alive, pedals moving and their hands flew across the nearly 100 strings shared between them. They worked their craft with great intricacy. The Duo played with acute sensitivity and what seemed to be telepathic communication. Through their excellent technique and authentic performance, they were able to work a small miracle. For as long as the music lasted, Kristi and Kathryn were able make the music become a tangible and living thing. It was captivating and ephemeral at the same time. You felt as if you’d glimpsed something you’d never known had existed, and then it was gone—but you longed for just one more glimpse, one more second, so that you might experience it again. The most fascinating part of the performance? No transcriptions, no orchestra reductions, or piano adaptations—the program was all modern contemporary music written specifically for harp duo. In the case or Robert Paterson’s Scorpion Tales, the music was written for Duo Scorpio. This is at the core of Duo Scorpio’s mission, to increase the repertoire written for harp duo, and to promote it. But what interests me most is the Tuxedo Revolt notion that it is not enough to promote new music alone, but to do it in a way that makes a real connection to the audience. The audience of last Tuesday night wasn’t just connected… Duo Scorpio pulled them to the very edge of their seats.